One of the joys, I find in McLaren Vale, is the small McLaren Vale wine producers who make wonderfully rich and different wines. Gilligan Wines is one of these type of producers. 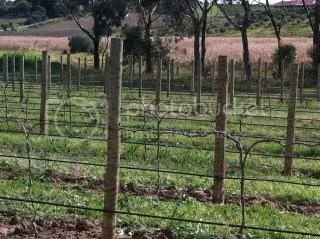 They have 2 vineyards, one vineyard of Shiraz that is on the foothills between McLaren Vale and Willunga and the other vineyard is at the Dowie Doole facility on California Road has young Grenache, Mourvèdre, Marsanne and Roussanne. These 4 varieties make the 2 wines made under this label – a Roussanne/Marsanne blend plus a SGM blend. Based on these wines the owners of this small wine venture are smitten with Rhone wines – and why not. The wines have a level of quality and a level of difference that means they should be sought out. Traditional white wine grapes can, at times, be of varying quality from McLaren Vale to the point that many growers are looking at alternate varieties that can produce the flavor profile while getting the acid and sugar balance right while growing the in the warm McLaren Vale summer. Well many could do worse than check out these 2 white varieties. This 70%:30% blend shows what this balance can achieve. There is plenty of flavor here as well as acid. To add to the complexity here the wine say 3 months in old Chardonnay barrels. This wine has interesting smeared all over its aromas and flavors. Green apple aromas move into stone fruit and melon flavors with a wonderful creamy texture that has a long. long acid finish. This is a food wine that can take flavor – maybe try it with chicken cooked with 40 cloves of garlic. I know this wine is sold out – but watch out for the next release. One of my favorite blends and this wine does not disappoint. there was something immediately interesting here and I will admit that I could not work out what it was. The Shiraz portion of the wine was co-fermented with the Roussanne pressings (from the above wine). The result is a real lift added to the aromas from the red fruits that comes through the from the Grenache. The wine had a portion unoaked and the remainder oaked with various aged barrels – in other words they have been smart by producing the best wine they can from small volume by keeping small parcels separate and treating them differently. Blending of these small batches allows the winemaker to produce the style they are looking for without compromise. This outcome is worth the efforts. There is balance here the red fruits from the Grenache, with the structure of Shiraz and the strength of Mourvedre mixed with a layered tannin structure that is not over bearing. I can see a big pan full of chilli mussels in this wines future. This entry was posted in Mclaren Vale, wine and tagged Grenache, Marsanne, Mclaren Vale, Mourvedre, Roussanne, Shiraz, Willunga South Australia, wine. Bookmark the permalink.